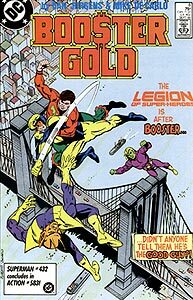 Cover Description: Booster Gold fights an aerial battle with Ultra Boy, Chameleon Boy and Braniac 5 of the Legion of Super-Heroes over the Metro Bridge in Metropolis. Brief Synopsis: While three members of the 30th-century Legion of Super-Heroes return to the 20th-century to bring Booster to justice for his theft of 25th-century technology, the 1000 plots the assassination of the American President. Issue Summary: Discovering an unknown time machine in the 30th century, Brainiac 5 of the Legion of Super-Heroes vows to travel into the past to search out how one Michael Carter is involvement with the time machine. Michael Jon "Booster" Carter crash lands a stolen time machine outside of Metropolis in 1985. Gathering his other ill-gotten gains, including Skeets, he travels into the city. 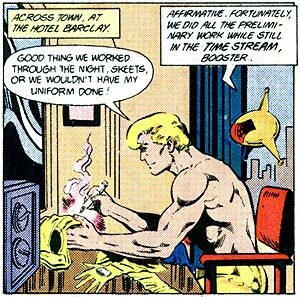 Booster rents a hotel room with a stolen credit card and gets started creating his super heroic persona. Elsewhere, the director of the 1000 puts his plan in motion to replace the President of the United States with an impostor. This plan is to be executed by a clay-faced mercenary named Chiller. Simultaneously, Brainiac 5, Chameleon Boy, and Ultra Boy arrive outside of Metropolis and suspect that Booster Carter will be involved with an assassination attempt on the President. Issue Notes: This issue takes place on August 21, 1985. On August 21, 1985, Ronald Reagan appointed 13 members to the National Highway Safety Advisory Committee. In this comic, he is hijacked by an assassin in his limousine while in Metropolis. Coincidence? Appearance of Braniac 5, Chameleon Boy, and Ultra Boy in the year "2986 A.D." [sic]. The letters "A.D." (an acronym from the Latin Anno Domini) should appear before a date indicate that the date is counting sequentially up since the year 1, the first year of the life of Jesus Christ, the man that Christians believe to be the son of God. Christian denominations make up nearly 1/3 of the world's religions. In recent years, the use of "A.D." has been gradually replaced with the more secular "C.E." (an acronym of the words "Common Era"). Appearance of Rip Hunter's Time-Sphere, which Booster stole. The Time-Sphere shows extraordinary damage. HIS STORY: Dr. Manning reveals that historical records in the year 2986 fail to indicate that Michael Carter of the year 2462 was Booster Gold in the year 1985. Booster is terribly frightened that the general public may discover that he has a past as a thief, so it is comforting to think that his secret was never discovered by historians of the future era. Narrative balloon reveals that Michael Jon Carter returned to Metropolis in the year 1985 on August 20. Booster mentions that his journey back through time took him through a "severe time storm." Perhaps this time storm is related to the "Time Void of 1986" mentioned by Skeets in the previous issue (Booster Gold #7). POWER UP: Skeets reveals that Booster's augmented strength is great enough to lift several tons "easily." This is the first time that Booster's strength has been quantified. Narrative balloon describes Booster and Skeets as "the Team of Tomorrow." Booster is unaware of the concept of "cash," though his theft of a Visa card demonstrates that he understands the concept of "credit." Perhaps in Booster's future, where readily exchanged imaginary "credits" have replaced printed bills and minted coins, the word "cash" has become outdated. Booster's first lodgings in 1985 were in the Metropolitan Hotel Barclay, room 822. The doorman at the hotel thinks that Booster's fashion reminds him of Miami Vice. This is the first of many references to the popular police-drama television show in this book. Broadcast from 1984 to 1989, the highly imitated style of Miami Vice influenced fashion throughout the second half of the decade. Booster's stolen Visa card is in the name of Mr. Jesus Alvarez and has an expiration date of 1998. Skeets is a Bx9 Security 'Bot. HIS STORY: Booster has chosen this time to make his debut in the 20th century because he is aware that there will be an assassination attempt made against the President and the Vice-President by a shape changer. Chronological first appearance of the Director of the 1000. FIRST APPEARANCE: First Appearance of The Chiller, "the best Hit Man money can buy!" Despite his boast, the Chiller won't appear elsewhere in the DC Universe outside the pages of the Booster Gold until Underworld Unleashed #1. A billboard welcomes President Reagan to Metropolis on August 21, 1985. Braniac 5 misinterprets Booster's motivation for traveling into the past and suspects him of planning the assassination of the President. Clearly this misunderstanding will lead to a confrontation between the two heroes, as has long been the tradition of superhero comic books. The President's Secret Service code name is "Rawhide." In addition to actually being president Ronald Reagan actual Secret Service code name, Rawhide was a western-themed television show popular in the 1950s. It is most notable as the springboard for future box office draw Clint Eastwood, who was popularized in the role of Rowdy Yates. The term is used for President Ronald Reagan, himself an actor appearing in many western films during the 1950s, though never on the television show Rawhide. FASHION ALERT: Booster and Skeets rewired and cosmetically redesigned the stolen equipment to create Booster's original Mark I superhero costume as it appears throughout the first volume series of Booster Gold. POWER UP: Booster reveals that his wristbands control and monitor the energy levels of the suit. The power rods are inserted directly into the wristbands. POWER UP: Booster Gold flies, using his stolen Legion Flight Ring, for the first time on August 21, 1985. 4. infrared and telescopic goggles" super-strength circuitry woven into the costume. Appearance of Ronald Reagan, President of the United States in 1985, giving a speech before a surprisingly small and apparently disinterested crowd of people. Booster and Chameleon Boy mistake one another for the attempted assassin, leading to a fight between Brainiac 5, Chameleon Boy, Ultra Boy and Booster Gold. This is Booster's first interaction with the Legion of Super-Heroes. This is also Booster's first chronological fight as a superhero. And, of course, it's against other heroes. The President's limousine Secret Service code name is "Stagecoach." Stagecoach was also a 1939 western film directed by John Ford and starring John Wayne in their first of many collaborations. HIS STORY: Booster is familiar with Chameleon Boy's alien race, the Durlans. It is therefore safe to assume that by the 25th century, humanity is widely familiar with alien races. Appearance of George H. W. Bush, Vice-President of the United States in 1985 (and future 41st President of the United States). Boosterrific Review: Booster Gold's first adventure finds our 25th-century hero struggling against the 31st-century Legion of Super-Heroes save 20th-century U.S. President Ronald Reagan. Throw in the debut of Booster’s costume and powers, credit-card fraud, and a shape-shifting assassin, and you’ve got everything a 1980s comic ought to be. Frame this issue, it's art. It's a great issue, an oustanding combo of fun and action though I'm a little baffled why the President and the VP would be allowed in the same car. Booster's 20th century debut is memorable to say the least.